Modernist designer Enzo Mari has given Berlin-based CUCULA the rights to redesign and sell his Autoprogettazione furniture to raise funds for its refugee support programme (+ slideshow). The Autoprogrettazione manual was created by Italian designer Enzo Mari in 1974 as a design guide to a collection of furniture that could be assembled from the most basic materials, using just a hammer and nails. After hosting a workshop for West African refugees based around Mari's principles, CUCULA founder Sebastian Däschle contacted the designer who agreed to let the organisation recreate and sell his designs from the manual. The CUCULA educational programme aims to help refugees by teaching them to design and build furniture, and also offers general education, assistance with language skills, and legal advice. 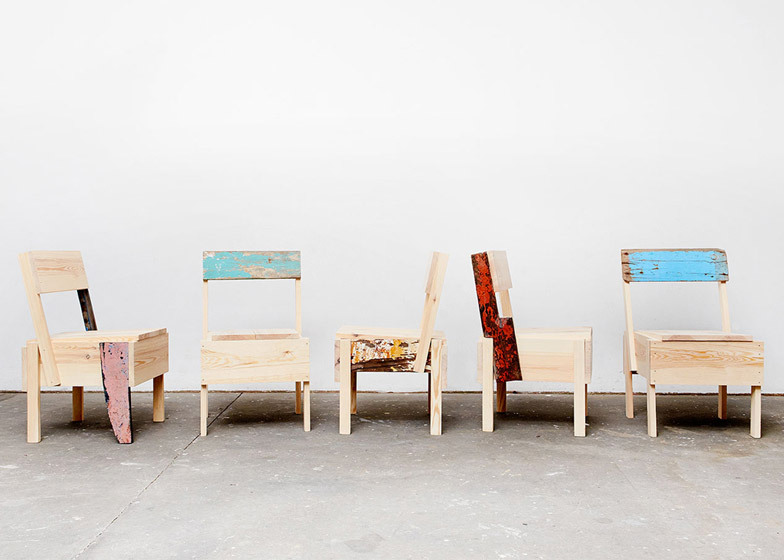 Under Däschle's guidance five refugees from the organisation have created limited-edition versions of Mari's furniture. Pieces were built using wood from refugee camp huts, as well as planks from boats used to travel to Lampedusa – an Italian island that serves as a European entry point for many migrants. "This is how the young African furniture designers turn chaos and desolation into high-quality objects, which in their engaging aesthetic invite for a dialogue," a spokesperson from CUCULA told Dezeen. "They are ambassadors – ambassadors of their stories, for an attitude, for an idea," they added. Political unrest and fighting in Africa and the Middle East has generated a huge influx of refugees into Europe, with Germany receiving the largest number of asylum seekers. CUCULA, also called the Refugees Company for Crafts and Design, was founded in 2014 in response to the crisis. According to the group, its name originates from the African Hausa language and means to do something together or to take care of each other. CUCULA's Enzo Mari collection includes the Bambino children's chair – a smaller version of Mari's Sedia design – and a bench which offers storage space under a liftable seat. Other CUCULA participants have changed the proportions of Mari's original designs, creating furniture that's personalised for taller or shorter users. "We want to offer real jobs for refugees and building up a company as an economical integration model," said a spokesperson. "The concept of the whole model is aiming to give refugees the real possibility to provide for their lives and to build up a future." "We are still fighting for the work visa through CUCULA," they added. "The contracts to employe the trainees are at the immigration office – it's a long bureaucratic process." In an opinion column for Dezeen, Vienna-based designer Talia Radford highlighted the need for designers to help find solutions for the ongoing refugee crisis. It's a subject Design Academy Eindhoven graduates also turned their attention to this year. Projects included a mobile embassy for migrants, a conceptual citizenship-swapping digital platform, and a living room designed to bring Dutch locals and refugees together to socialise. Four pieces created by CUCULA designers will be shown at the Cologne Fine Art fair, which runs from 18 November to 22 November 2015. All revenue from chair sales will go back towards supporting the project. Finnish furniture brand Artek put Mari's Sedia chair into production in 2010. Customers could purchase pre-cut pine boards, nails and instructions and construct the object themselves. Photography is by Verena Brüning, unless otherwise stated.